March 10, 2012 (Miami, Fla.) – The leaders today became winners as the 2012 edition of BACARDI Miami Sailing Week (BMSW) presented by EFG Bank came to a close as the final races of the series were held for the Star, Audi Melges 20, Melges 24, Viper 640 and J/80 classes. Over 150 boats with competitors from 16 countries and across the U.S.A. have enjoyed elite competition on Biscayne Bay, as well as the hospitality for which BACARDI is famous. The third annual running of BACARDI Miami Sailing Week also marked the 150th anniversary of the BACARDI Company. With five races already on the scoreboard, the Star fleet today completed the sixth race for the 85th BACARDI Cup, being held for the 50th year in Miami. Briefly postponed, the final race for the Stars got underway with just seven knots of breeze from the east southeast. The Swiss team of Flavio Marazzi and Enrico De Maria were across the finish line first, followed by Miami’s own Augie Diaz with Bruno Prada, and 2008 Star World Champions Mateusz Kusznierewicz and Dominik Zycki (Poland). Xavier Rohart and Pierre-Alexis Ponsot (France) were across fourth, followed by 2008 Olympian Peter O’Leary and David Burrows (Ireland). By finishing ahead of the Irish team, Rohart and Ponsot, who had started the day with a three-point lead on O’Leary and Burrows, maintained the point spread to win the championship title with 13 points. O’Leary and Burrows, with 16 points, and Kusznierewicz and Zycki, with 18 points, filled out the remaining podium spots. Diaz and Prada, with finishes of 11-4-7-5-8-2; 26, moved up to fourth overall, with day one leaders, Austria’s five-time Olympian Hans Spitzauer and Gerd Habermueller, finishing fifth overall with 29 points. With a win of today’s single race for the Audi Melges 20 fleet, Michael Kiss (Holland, Mich.) clinched the championship with 20 points and a nine-point lead Paul Reilly (Chicago, Ill.) who placed sixth in that race to take second in the overall standings. By crossing the finish line in second place, Marcus Eagan (Madisonville, La.) drilled down the point spread between himself and Reilly, going from being four points behind to being tied on points. On the tiebreaker, however, Eagan remained third in the overall standings with 29 points. Luca Lalli (Milan, Italy) finished fifth in the race to end the series with 36 points, followed by Alessandro Rombelli (Milan, Italy) in fifth overall with 46 points. There was no change in the top-five positions in the 21-boat Melges 24 class on the final day of racing for BACARDI Miami Sailing Week. Franco Rossini (Switzerland) won the final race of the series to cement his position as fleet leader with 11 points, while increasing his lead from three to seven points over Riccardo Simoneschi (Milan, Italy) who finished 11th in the final race. Conor Clarke (Ireland), with 24 points, Kristen Lane (Tiburon, Calif.), with 33, and Alan Field (Los Angeles, Calif.), with 37, complete the final top-five. Finishes of 2-7-2 across the final three races contested by the 14-boat Viper 640 fleet was just the right combination to allow Glyn Locke (Isle of Wight), David Chapman (Sydney, Australia) and Ian Nicholson (U.K.) to successfully defend their title with 12 points. The biggest mover in the fleet was Justin Scott (Greenwich, Conn.) who moved from fourth to second overall after today’s finishes of 3-1-6 gave him 38 points, just edging out, by one point, Lee Eikel (Mandeville, La.) who placed 14-8-5 today. With finishes of 5-5-4, Phil and Wendy Lotz (Newport, R.I.) were able to move ahead of Craig and Deborah Wilusz (Ft. Walton Bach, Fla.) even though the Floridian’s had won the opening race of the day. The Wilusz’s followed with 9-11 for a net 46 points, four points behind the Rhode Island team. 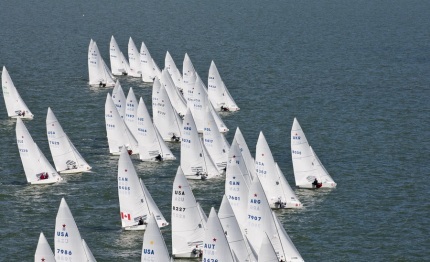 Three final races were sailed by the J/80 fleet to complete their series debut. Glenn Darden (Ft. Worth, Texas) led the standings all the way to the win, which he wrapped up without needing to sail the 10th and final race. Darden won the first two races of the day, and discarded the 10 points from not sailing the final race to net 14 points for the series. Henry Brauer (Marblehead, Mass.) moved from fourth overall to second with 30 points after finishing 3-2-1 today. Gary Kamins (Pacific Palisades, Calif.) with 4-5-5 ends the series with 33 points, followed by Rick Schaffer (Ft. Worth, Texas) with 41 and Nizar Abueni (St. Paul, Minn.) with 44.